The Telephone in the Corner is a traveling dance show, part of the educational module, with the same name, dedicated to high school students in Bucharest. Bearing the name of one of the most famous poems written by poet Cristian Popescu, the project designed by Control N is composed of two sides: a theatre-dance performance, based on the poems by Cristian Popescu and a series of discussions with teenagers from Bucharest. The Telephone in the Corner is a cultural project financed by the Cultural Program Esti Bucuresti 2015. Combining theatre, dance and photography, The Telephone in the Corner aims to initiate the young audience both understanding the role the poet Cristian Popescu had in the history of Romanian literature and understanding a different type of artistic expression – a theatre-dance performance. The performance was created by Oana Rasuceanu, together with actors Adina Lucaciu, Irina Velcescu, Cristian Popa and George Albert Costea. The sets and the costumes are created by Andrada Chiriac and the music was composed by Sebastian Hamburger. The video projection and the photos which are part of the show were done by photogtapher Adi Marineci. Starting October 27, 2015, the performance will be presented in 5 high schools in Bucharest: National Art College “Dinu Lipatti” (October 27 at 17:30), Bilingual High School “Miguel de Cervantes (October 29 at 16:30), National College “Gheorghe Lazar” (November 2 at 17:30), Theoretical High School “Jean Monet” (November 3 at 17:30), National College “Sf. Sava” (November 3 at 12:30 and 18:30). Each of the performances will be followed by discussions with the young audience and the creators. Special guests will also be invited to the discussions, writers Florin Iaru and Cristian Tudor Popescu, who will talk to the students about the work of the poet Cristian Popescu and the importance of his work, very little known to the new generation. 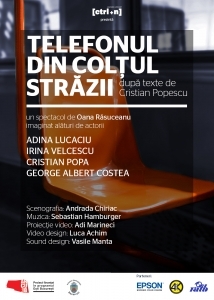 The performance and educational module The Telephone in the Corner is fully inspired by the work of Cristian Popescu and it aims at offering teenagers the chance to discover the very special world he creates in the volume Cuvant Inainte (published in 1988).